The Betterment Stock split dashboard. The range of possible jobs post-college have skyrocketed since I graduated college. And with many people working from the internet, like me, it makes the traditional route to building wealth a bit trickier. I’ve worked as a self-employed freelancer since graduating college a decade ago. As such, I never started a 401(k) and I always thought that starting an IRA seemed overly complicated. That assumption though just meant I delayed a long time until, at age 26, I sat down with Schwab broker. Together we picked a ‘safe’ mutual fund, and I opened an IRA — my first long-term savings plan. That was the beginning of my journey. A few years later, I used the free Wealth Calculator to assess my progress toward my retirement and long-term goals and was shocked to see that I needed to double my current monthly investing numbers to reach those goals. I’ve read a lot in personal finance, and it seemed the next step for most people in a similar situation is an automated investing tool. And there are a lot out there! Acorns: If you’re just getting started on your wealth journey, this is ideal. There are no account minimums and they automatically invest spare change from everyday purchases into a diversified portfolio. If you don’t have a nest-egg yet, or you’re still mostly focused on reducing debt, this is the perfect option to start slowly with a regular but manageable savings habit. Betterment: This is a mid-road option. You can start with no minimum account balance the fees are very low if you can set up an automated deposit of at least $100 per month. It’s ideal if you’re in the middle of your wealth journey and you want to invest little upfront cash but still have full automation and strong investment options. Wealthfront: This company has rave reviews and is a solid choice if you having a nest-egg established and ready to move into long-term investments. They have an account minimum of $5,000, so they are ideal for the advanced wealth builder! 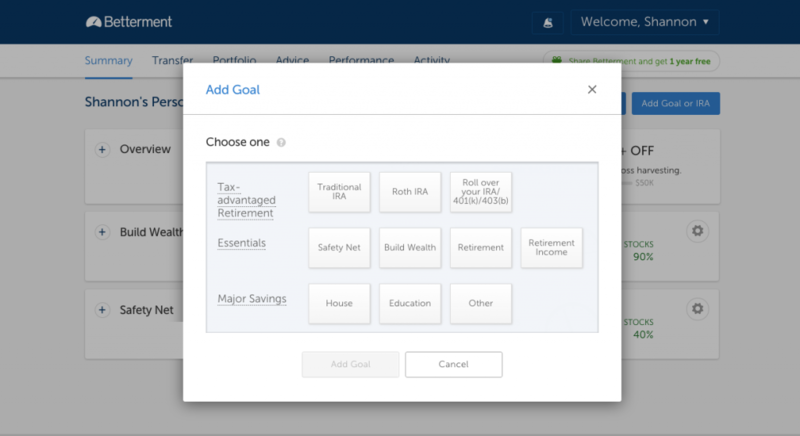 Betterment was that Goldilocks combination of “just right” for my situation, and here’s what I’ve loved about them in the months since I started using their automated investing platform. Ease of use: They have an open, clean interface with easy access to account and goal information. 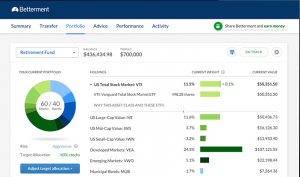 It’s broken down into layman’s terms so you can easily understand every aspect of your portfolio. Risk assessment: Betterment clearly delineates goals and investments by risk versus reward. Mix of stocks and bonds: A carefully selected group of options, few choices, but it’s an effective way to help decide the best mix of allocation of your funds. Fully automated: Betterment’s complex algorithms take care of everything in your accounts you could possibly need from rebalancing to tax loss harvesting as well as your automated monthly deposit. These are their initial, sample investing goals. Pick one and then the automated system helps you choose an allocation ratio between stocks and bonds that makes sense for your goal and timeline. Quarterly fees: The company charges a flat percentage on a quarterly basis, but it’s comparatively very fair and competitive for the industry. Market risk: They have a good mix of stocks and bonds to limit risk, but, with all investments, you have to invest knowing you could lose money, which is true of every platform, not just Betterment. Fully automated: This is not idea for those interested in actively trading stocks. This post explains other options if you’re a bigger investor and don’t need to pay for the automation aspects. The dashboard has a clean interface showing allocations for each of your goals, as well as a simple way to view your balance, as well as your earnings on that goal. Sign up at Betterment and go through the steps to link your bank account — this is ideal because it allows you to easily set up an automatic monthly deposit. Assess the automatic risk profile associated with these goals and ensure the ratio is ideal for your current financial situation. Have patience! Don’t watch the ups and downs of the daily stock market, instead set it and forget it. These are long-term goals and you must resist constantly moving funds. Have you used Betterment or another automated investing platform? Let us know in the comments.